allows you to send emails to anyone you wish, with the ability to have them sent at any future date and time you choose. A feature missing from every email service is the ability to schedule when an email gets sent - you must click the "send" button at the exact moment of delivery. With this service, you can write emails with your existing email address, and they will get sent at the exact date, ordates that you specify - down to the minute. Send emails later from your own email program! Click on Sign up For Free button and fill your information. Now verify your account by visiting your Email Address that you had given in the Sign up process. Now click on the Compose button to send a new Email. 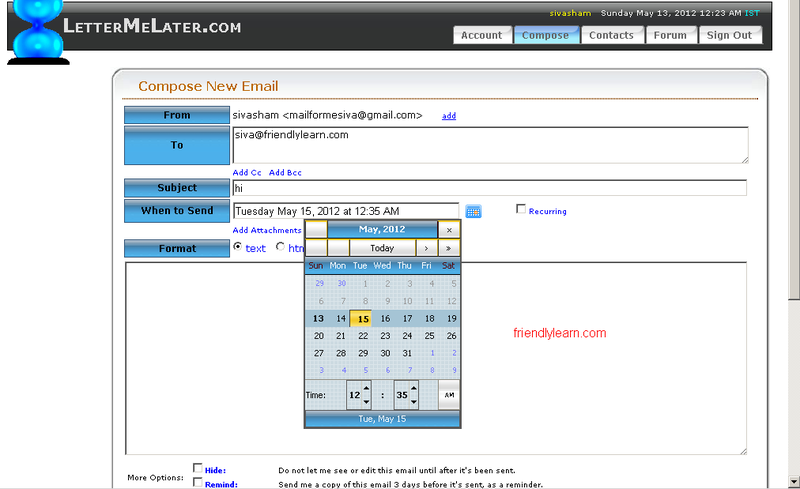 Click on the Calendar button to set date and time when you want to send your Email and attach a file if any. Click on Schedule to be Sent now your Email will be sent on your scheduled date.